For 20 years, long-range regional mitigation planning has produced projects with sustainable ecological benefits at less expense to the FDOT and the taxpayers. Pursuant to Section 373.4137(4), F.S., the District is required to develop a mitigation plan for wetland impacts associated with the Florida Department of Transportation (FDOT) roadway projects. The mitigation plan is annually updated to add and/or remove projects, incorporate revised wetland impact estimates from the FDOT, and make any necessary modifications to previously approved plans. The District’s FDOT Mitigation Plan is required to be developed by March 1 of each year and submitted to the District’s Governing Board for approval then submitted to the Florida Department of Environmental Protection (FDEP) for final approval. The 2018 Draft Plan was presented at a publicly noticed workshop held on December 21, 2017 at the District’s Tampa Office. Based on public comment and input, the Draft 2018 Plan was subsequently presented at the District’s Governing Board meeting on January 23, 2018. On March 22, 2018 the plan was submitted to FDEP and was approved by correspondence to the District in a formal approval letter dated March 28, 2018. The letter states the FDEP had reviewed and approved the Plan and furthermore, satisfies the requirements of 373.4137(4), Florida Statues. The Florida Department of Transportation (FDOT) historically conducted mitigation for wetland impacts associated with roadway construction on a project by project basis. The majority of these mitigation activities were associated with creation and enhancement of habitats adjacent to the roadway facilities. Existing and future commercial, industrial and residential developments along these roadways subject constructed mitigation areas to many limitations and risks in achieving the desired ecological benefits needed to compensate for wetland impacts. These developments also reduce mitigation opportunities as well as increase the cost of mitigation projects, primarily a result of the availability of property and the cost of acquisition. In 1996, the State Legislature determined that mitigation would be more effectively achieved with regional, long range mitigation planning instead conducting mitigation on a project by project basis and created the FDOT Mitigation Program (see Section 373.4137, Florida Statutes). This program is administered by the state’s water management districts, which are responsible for annually developing a mitigation plan with input from various Federal and State regulatory and resource agencies, including representatives for public and private mitigation banks. The Draft Plan is presented at a publicly noticed workshop and then subsequently it is presented to and approved by the District’s Governing Board. Following Governing Board approval, the Board-approved plan and associated tables are submitted to the FDEP by the March 31 deadline. The FDEP reviews the Draft Plan and once approved via correspondence to the District in a formal approval letter the plan is finalized thus, satisfying the requirements of 373.4137(4), Florida Statues. The FDOT annually provides the District an inventory of anticipated construction related wetland impacts and updated information for previously identified transportation projects. Advance information is also provided for larger projects scheduled beyond FDOT’s current work program for mitigation planning purposes. The inventory provides information such as the watershed location, acreage, habitat type and quality of expected wetland impacts associated with each project. The cumulative inventory of all the facilities from 1996–2020 currently includes 218 transportation projects. A total of 713.73 acres of wetland impact have been or are proposed to be offset by mitigation projects in the FDOT Mitigation Program. 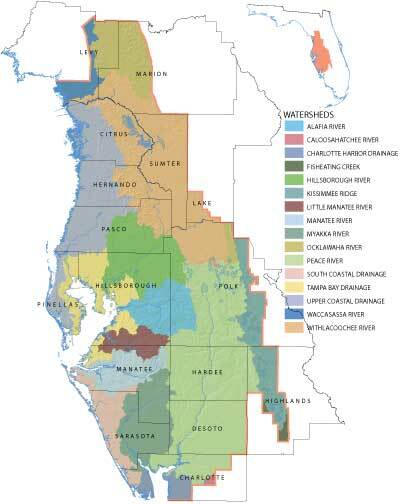 Based on the impact information provided by the FDOT, mitigation options are matched to FDOT road improvement projects such that the State and Federal permitting requirements for offsetting wetland impacts are satisfied. Mitigation options are mitigation projects developed through the FDOT Mitigation Program or mitigation bank credits purchased from a private or public mitigation bank. The purchase of mitigation bank credit is considered when the purchase would offset the impact of the transportation project, provide equal benefits to the water resources as other mitigation options being considered, and provide the most cost-effective mitigation option. To date, 50.84 acres of wetland impact have been offset through the FDOT Mitigation Program with the purchase of mitigation bank credits from six private or public mitigation banks. Mitigation projects established through the FDOT Mitigation Program are to focus on activities of the water management districts and the Department of Environmental Protection such as Surface Water Improvement and Management (SWIM) projects, land acquisition and control of invasive and exotic plants to the extent these projects meet mitigation requirements for the FDOT road improvement projects. There are 37 mitigation projects that have been established through the FDOT Mitigation Program of which 15 are SWIM projects, 7 contain a land acquisition element and 14 contain an invasive and exotic plant control element. Two notable mitigation projects are Ft. DeSoto Park (SW 70) recognized by the National Oceanic and Atmospheric Administration with a Coastal America Partnership Award and Circle B Bar Preserve (SW 66) recognized by the Audubon of Florida and USA Today for the wildlife use of the restored habitats. General information for the program, roadway projects, wetland impact and designated mitigation projects can be accessed within the complete annual approved 2018 FDOT Mitigation Plan.